Houston-based Sanchez Energy Corporation announced in May of 2014 that it has entered a deal with Royal Dutch Shell subsidiaries in the Eagle Ford to purchase 106,000 net acres for $639-million. The acquisition increases Sanchez's total net Eagle Ford acreage to 226,000, and adds 60 MMBOE of proved reserves, nearly doubling the company's acreage position and proved reserves in the play. During the first-quarter, the acquired assets had production of 24,000 boe/d (60% liquids). Sanchez estimates there are at least four years of drilling inventory from 200 "de-risked" wells in the new acreage, which extend across Dimmit, La Salle and Webb Counties. This most recent acquisition is the largest for Sanchez in a string of acreage deals beginning early last year. 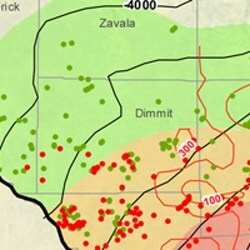 In March of 2013, the company purchased 43,000 net acres in Dimmit, Frio, La Salle, and Zavala counties from Hess Corporation for $265-million. At that time, the acquisition from Hess also doubled the size of the company. In June of 2013, Sanchez stuck another deal for Eagle Ford acreage, acquiring 10,300 net acres in Fayette, Lavaca, and Gonzales counties for $28.8-million. In September of 2013, Shell announced it had plans to sell 106,000 acres in the Eagle Ford. The oil giant, unlike many other companies in the Eagle Ford, didn't meet its internal targets for size and profitability in the play. With the divestiture of its primary Eagle Ford assets, Shell retains 147,000 acres of non-operated leases in Maverick County. The acquisition is expected to close in the second quarter of 2014, with an effective date of January 1, 2014.